Our third trip to the Apennine Mountains took us to an area we hadn’t visited before. 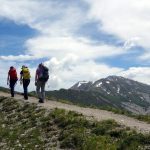 On the previous two occasions we concentrated our efforts on Corno Grande, peninsula Italy’s highest mountain, which towers a good 300m above the tallest of the surrounding peaks of the Gran Sasso massif. 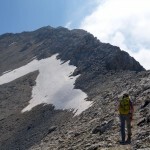 It’s much the most dominant peak in the region, but after two winter attempts which were curtailed by the snow conditions, we decided to return there in the summer, when it will be a very different mountain, a hike rather than a climb. The snow is receding now, but there was still plenty of it about when we left Edita’s flat in Rome at 6am. 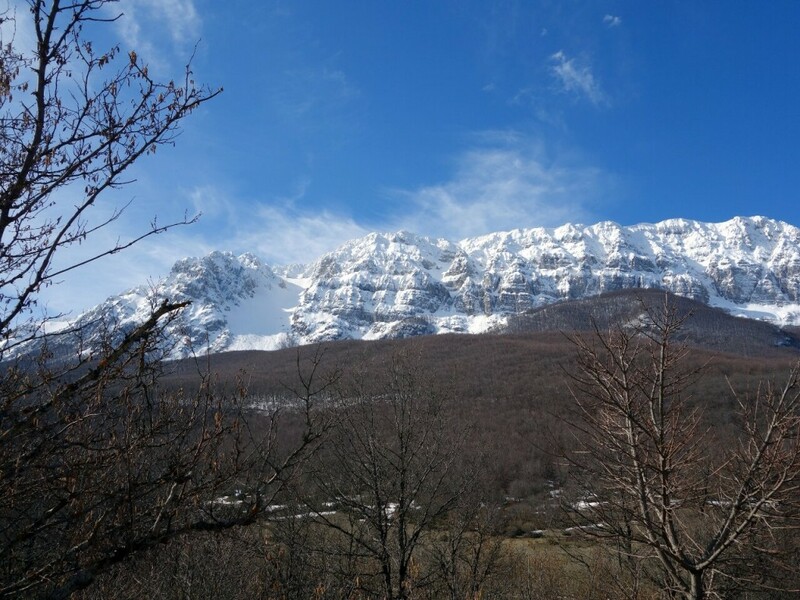 We chose the Monte Sirente massif in Sirente-Velino Regional Park as our destination this time, an area just to the south of Gran Sasso, aiming to reach its highest point, Monte Sirente (2348m). We had an interesting drive just to get there, crossing the Altopiano di Campo Felice in thick mist, a high plateau surrounded by gentle peaks. We crossed a broad valley whiter than a sheep in a milk swimming pool, and visibility was down to a few metres. It was bleaker than UKIP’s foreign policy, and as we reached a tiny ski resort at the far end, a single snow plough crossed our path, and there appeared to be no discernible way out of the valley. Suddenly a tunnel appeared at the base of a mountainside, and we entered it, descending deeply into the mountain’s bowels. When we emerged at the far end we found ourselves high above a pleasant verdant plain. The clouds were clearing and pockets of blue sky appeared overhead. I now know what it must feel like to emerge into the real world from Narnia through the back of a deep wardrobe. 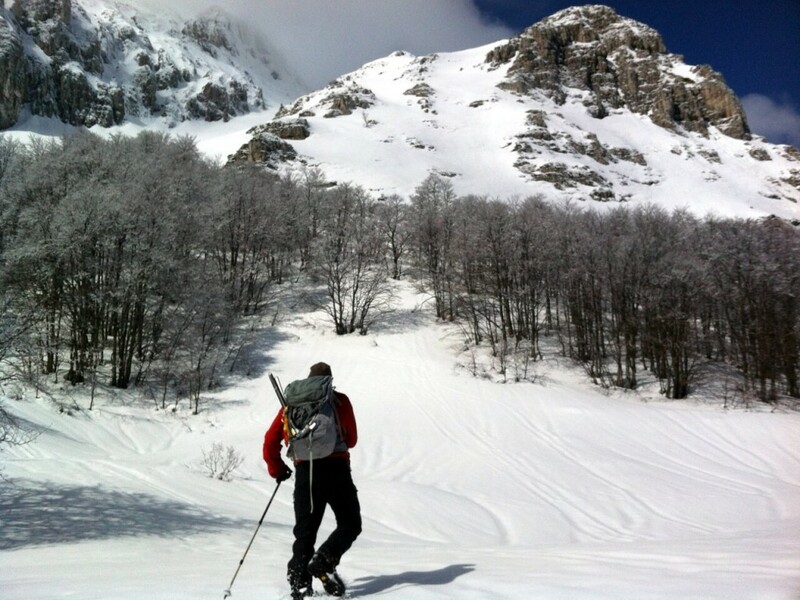 Monte Sirente was itself a bit deceptive, more of a long 20km ridge than a single mountain. As we drove along the valley on its northern side, all we could see of it was a wall of crumpled rock spurs separated by narrow couloirs, rising above a sea of beech forest. The contours on our map showed the mountain fell away much more gently on its southern side, but we had chosen the northern side from a route in our guidebook which followed a clear numbered trail. There was a car park beside the road at the foot of the trail. We were in the heart of the forest at an altitude of 1180m, already above the snow line. It was still only 8am and we had nearly 1200m to climb to the summit. The first 600m ascended through the forest, and as with our previous hikes in the Apennines, we were alone; no one had been this way before us. This meant the trail was buried beneath snow which at times was half a metre deep. Breaking trail in these conditions can be exhausting, but the hike can be eased significantly if you happen to be with someone who is training for something else. As we speak Edita is at Everest Base Camp, aiming to climb 8516m Lhotse, the fourth highest mountain in the world and also her fourth 8000m peak. I suggested it would be a good workout for her if she broke trail ahead of me, and much to my surprise she readily agreed. The numbered trails in this part of the Apennines are marked by red and white stripes painted on the trunks of trees and immovable boulders, very useful if the track itself is buried under snow and invisible to the eye. Quite often they were painted close to the ground, and I believe many were hidden by the snow. Frequently we lost sight of them, and had to split up and go our separate ways until one of us spied the next paint mark among the trees. We always found them in the end, and after a couple of hours we emerged into a clearing close to the tree line, and were greeted by the magnificent site of snow-dappled rock faces rising above us. We eventually lost the trail in another, larger clearing, and had to find our own way up to the tree line, but now we could see Monte Sirente’s many rock summits rising into the cloud, and it wasn’t hard to work out which of the couloirs above us led the way up to the main summit ridge. Four rocky peaks rose above us, the first two were compact towers separated by a narrow snow gully which looked to be more of an ice climb than a hike. In any case, the wider couloir to the right of the second tower had been swept by an avalanche, and any route in that direction would be dangerous in the present conditions. The only option led between the third and fourth peaks, the first more of a rock curtain beneath the main summit ridge, and the fourth a promontory of rock lying at the end of a subsidiary spur of the main ridge. The slope between these two peaks was also the route marked on the map. 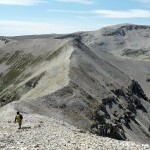 It lay parallel to the main ridge and was not as steep as the other two couloirs which led directly up to it. This slope also looked like it may be susceptible to avalanche, although it appeared to be safer closer to the right-hand peak. I dug a snow pit to assess the conditions, and was happy to see the snow appeared much firmer than the hazardous powder we had encountered on Corno Grande the previous month. It wasn’t perfect, but we thought it would be safe enough if we chose our route carefully. 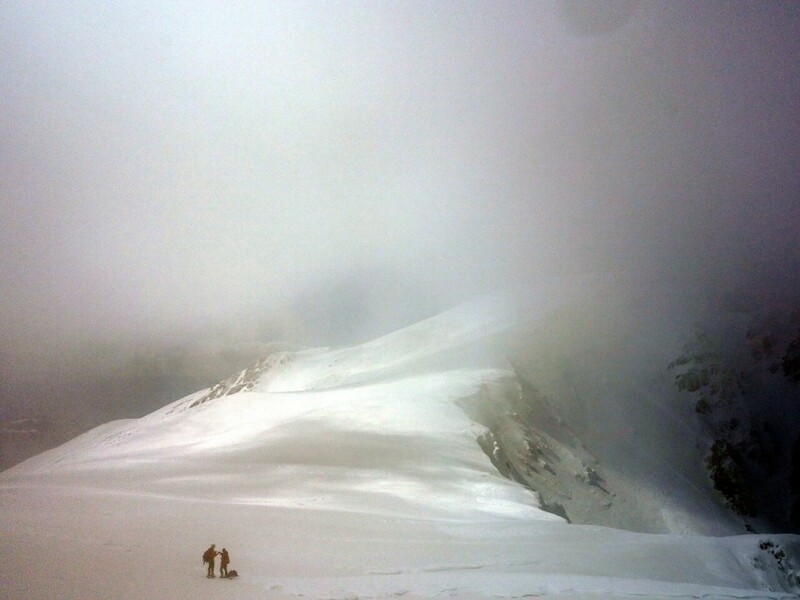 As we were putting on our crampons ready for the real climbing, we were surprised to hear voices below us, and a few minutes later two Italian climbers emerged from the forest following our footprints. Unlike us they were fully equipped with rope and technical ice tools. The older, more experienced of the two, spoke reasonable English, so we took the opportunity to ask him about the route and conditions. Like us he seemed keen to press on, though he didn’t think the snow was ideal, but his younger partner was less keen and shook his head when we pointed up the couloir we intended to ascend. I set off up it ahead of Edita for a change, but we had only climbed about 100m when she offered to take over the trail breaking. 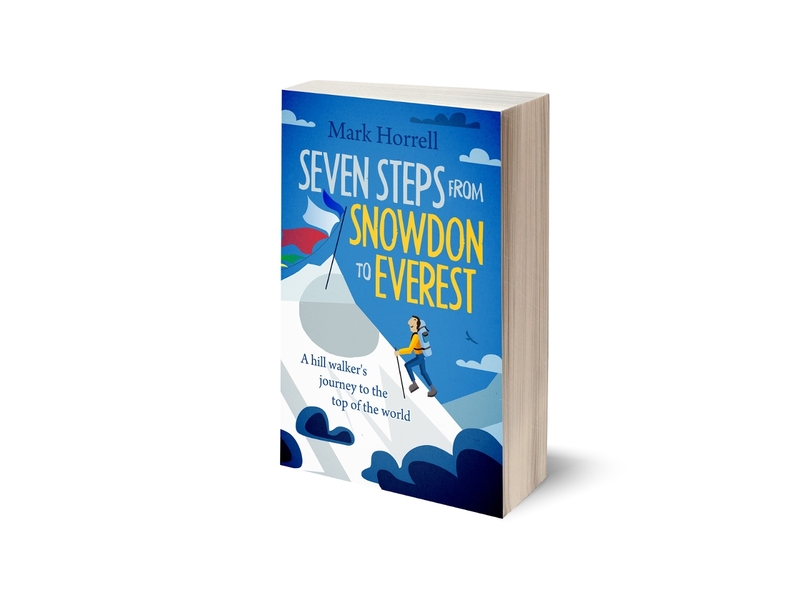 The snow was now very deep; I was frequently sinking beneath my knees and it was hard work. 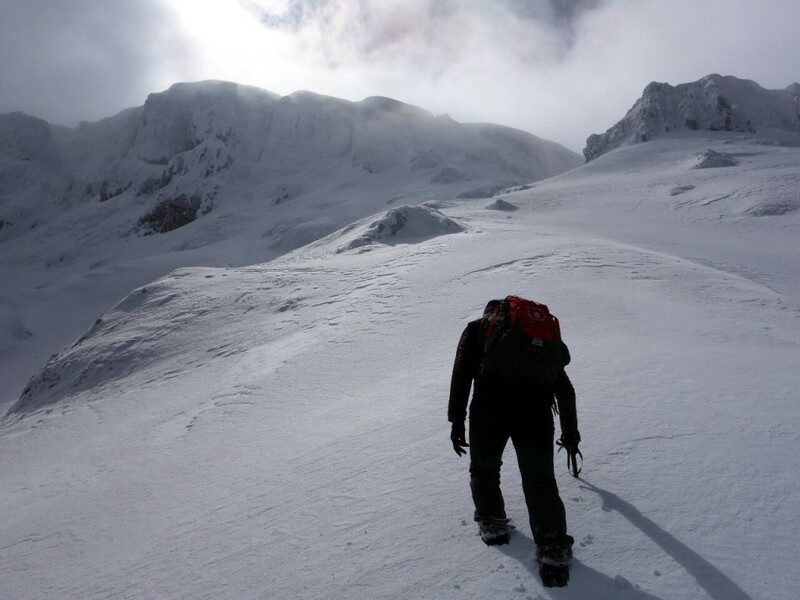 I knew she was training for Lhotse, and the trail breaking would be good exercise for her, but she had led the way pretty much all the time as we climbed through the forest, and it seemed unfair for her to do it again now the going was much tougher. I agonised over my decision for all of a quarter of a second. “Yeah, alright then,” I said, stumbling to get the words out quickly enough. 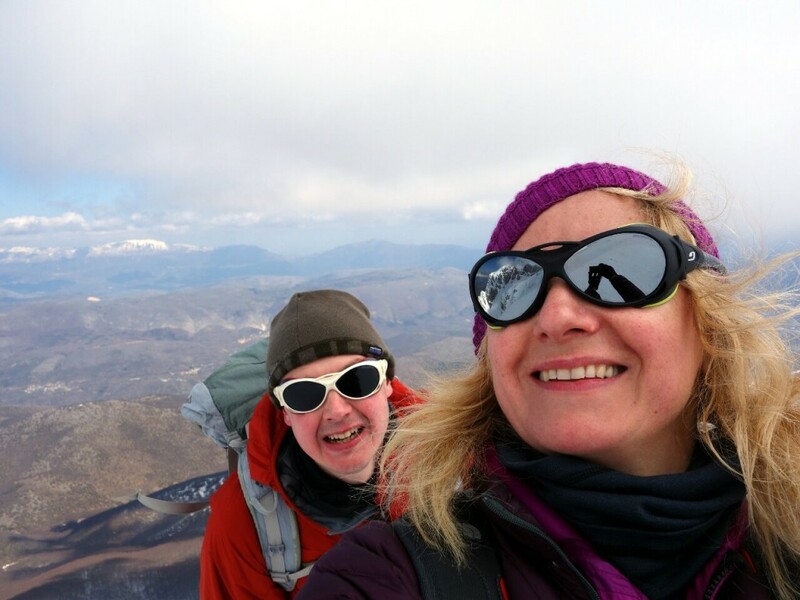 Selfie of me and Edita high up on Monte Sirente. As you can see, she looks absolutely fine while I look exhausted (Photo: Edita Nichols). She set off at a canter. She almost seemed to glide up the slope, and I struggled to keep up with her. I persuaded myself it was because she’s much lighter than me, and wasn’t sinking in as deeply as I was. Undeniable proof of this (as far as I was concerned) came soon afterwards, when the route she was creating appeared to pass over boulders and I fell right through a gap between two of them. I was in up to my hips and it took a while to extricate myself. By the time I wriggled back into Edita’s footprints she was a good fifty metres above me and I decided she was in good shape for Lhotse. My job was done, and it was no longer necessary for me to try and keep up with her. I looked back down the slope, and it didn’t surprise me to see the two Italians following us up the slope. Had I been debating whether or not to continue up a virgin snow slope, and seen someone else head up it, I expect I would have done the same, and followed behind. Edita was keeping to the right and angling her way up the side of the smaller peak, away from any avalanche risk down the centre of the couloir. We reached the spur between the smaller peak and the main ridge and stopped to take photographs. I took out my map and tried to match the route to the network of couloirs and ribs I saw above us. It looked like we needed to traverse beneath the cliffs to our left until we reached another spur about a quarter of a mile away, from where we would turn left between a gap in the cliffs and complete the final climb up to the main ridge. Just as we were leaving the older of the two Italians arrived. “I take my hat off to you,” he said, clearly impressed by Edita’s leading. 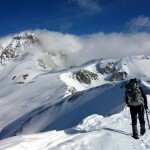 He said they intended to continue onwards to the main ridge but would probably stop short of the summit. He confirmed the route ahead was the one we had chosen. This time I led on for a change. There was little altitude gain until we reached the next spur, but this traverse was in some ways the most hazardous section of the route, with a risk of snowfall from the face to our left. I kept below the line of debris we could see had come down, but there was also danger to our right. 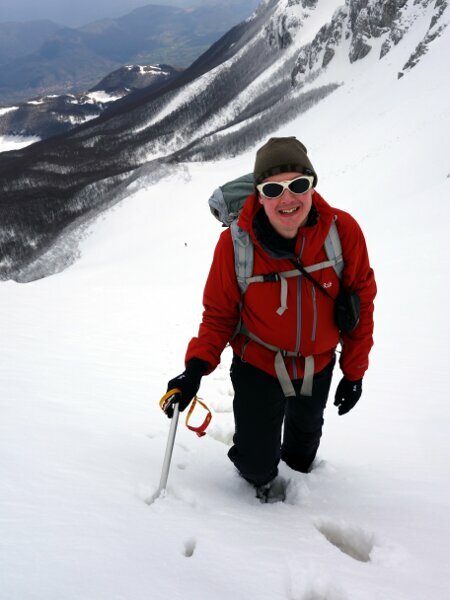 The slope below us wasn’t the steepest, and it would be a straightforward matter to arrest with our axes in the event of a fall, but the snow was less consolidated now, and there was a risk of it sliding. I trod carefully along the traverse until we reached the next spur, where Edita once again volunteered to lead the final steep section up to the main ridge. There were two possible routes upwards, either side of a rocky promontory. We could see the Italians following us, and Edita gestured back at them to enquire which one was the correct route, but really the decision was ours to make. I asked her which she felt more confident taking, and we agreed the left hand side looked more promising. The snow was almost becoming thigh deep, and Edita kicked huge buckets in it for me (and the Italians) to follow. They caught us up when we reached the walls of the rock promontory, and the older one overtook. Above this the couloir became much steeper, and the deeper snow was turning to ice. It took Edita several blows of her boot to kick a step in the slope, which I enlarged as I followed. Without those steps we knew it would now be very difficult for us to come back down. The younger Italian became frustrated with the pace and took out his two technical ice tools, which enabled him to overtake us easily on all fours. But we had only walking axes, and we had to continue kicking steps. It must have been tiring for Edita, and tough on her toes, but she didn’t complain. As we neared the top, one of the Italians reappeared over the edge and gave a whoop. He was holding up a rope, and Edita cheered. I had mixed feelings about that rope, in much the same way I have mixed feelings about a toilet with a seat that falls down as I’m peeing. He lowered it down to us, and we used it to climb up very quickly, hand-over-hand. It undoubtedly saved us a bit of time on the final section, but it meant the steepest part of all, at the very top, was devoid of the steps that would make our descent much safer. It would have been churlish for us to refuse the Italians’ kind offer, though. They knew we (or mainly Edita) had helped them out by breaking trail for most of the way up, and perhaps providing them with a little nudge when they were wavering. They in turn had helped us to climb the final section onto the ridge, and would help us get back down again. The summit was about half a mile away along the ridge, and about 100m above us. 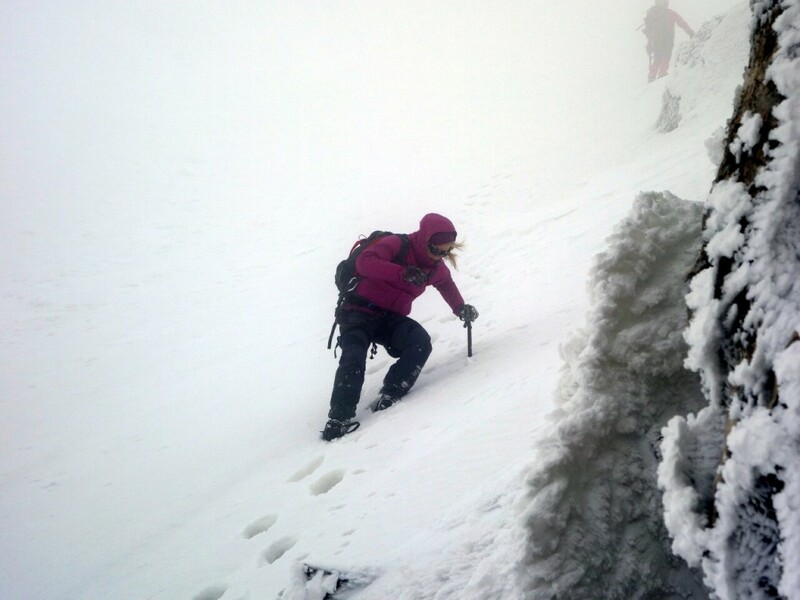 It was very windy as soon as we emerged from the shelter of the couloir, and we were now in cloud. There was no view, and this fact set me apart from the other three. Here in the UK cloudy conditions on mountaintops is normal business. It wouldn’t occur to any of us to stop short of the summit just because there was no view, any more than a Scotsman would pop a five pound note under a stone if he found one lying beside the summit cairn. Without going to the top the climb was in some way diminished. For the others the situation was very different, almost the opposite, in fact. It had been a good day out in the mountains and an exhilarating climb, especially the last section. There was no need to go a few steps further, in wind and cloud, just to tag a bit of rock a short distance away. “It is easy to the summit from here,” said the older man, “but here we go down, because now there is no point.” He swept his arm in front of him to indicate the cloud. They walked a little below the ridge to find some shelter from the wind, and started to eat their packed lunch. I discussed the situation with Edita. I wanted to continue to the summit, now it was straightforward, but that would mean descending the couloir without the rope. I thought it would be possible, though we would have to be careful. Edita wasn’t bothered about the summit. As far as she was concerned the day wasn’t in any way diminished without it, and she felt we should take advantage of the rope while it was there, an argument I could understand. We said goodbye to the Italians, and asked if they didn’t mind us using their rope, which was dangling down the couloir on an ice axe anchor. As soon as they saw we were leaving they started packing away their sandwiches, and insisted they come with us. I tried to convince them to finish their lunch, as we would have no difficulty descending the rope using an arm-wrap, but they wouldn’t hear of it. The older man showed me a technique to descend backwards using the rope as a seat while he paid out the end. This only got me half a rope length, then he had to let go of his end, and I armed-wrapped the rest of it. By the time I reached the end the rope I was back at the steps we had been kicking, and I descended to the rock promontory to wait for Edita. She was in a good mood, and my mild disappointment at not reaching the summit was swept away by her enthusiasm. It was hard work wading back down again. The snow was now much softer, and I frequently sunk to my thighs, but Edita was right. It had been a good day out and there was one consolation: it means we will have to come back in the summer when the snow is gone and climb it again. I hope to keep my hill walker’s leg muscles exercised in the Welsh and Cumbrian hills, my favourite mountain stamping grounds which are fast becoming replaced by the Apennines. Meanwhile Edita has a much bigger challenge on Lhotse, though it won’t take too much effort for her to improve on last year. You can see all my photos from the climb in p.2 of my 2015 Italy photo album. I’ve tried climbing it once, from the back and… got lost. 🙂 (hard to see the peak from the rear… very hard, actually – so it’s easy to lose your way). Wondering what guide book you used, for the route or trail reference/recommendation. A combination of the Cicerone guidebook Walking in Abruzzo, and the 1:25,000 Edizioni Il Lupo map for Sirente-Velino. Neither were perfect in those conditions, but both were helpful.